Punjab is located to the south of the ICT, and Khyber Pakhtunkhwa is located to the north west. 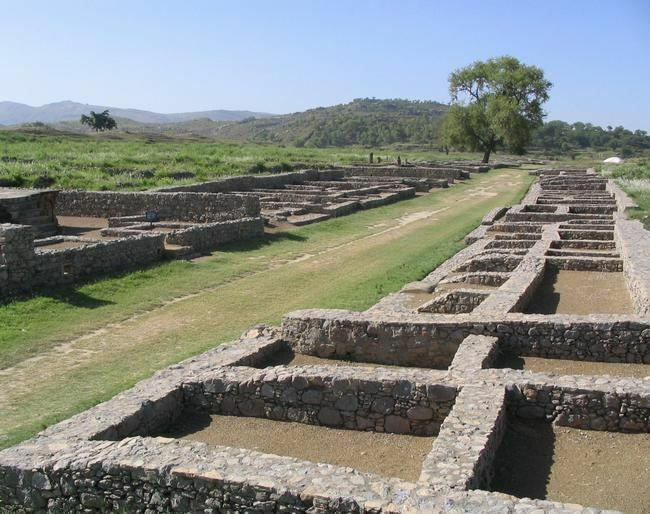 Islamabad was designed and built to be a modern capital for Pakistan. 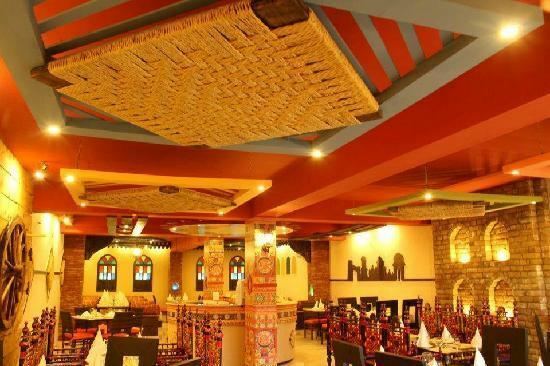 It was established in 1960, on the orders of then President General Ayub Khan. Islamabad nestles against the backdrop of the Margalla Hills at the northern end of Potohar Plateau. Its climate is healthy, relatively pollution free, plentiful in water resources and lush green. It is a modern and carefully planned residential city with wide roads and avenues, many public buildings and well-organised bazaars, markets, and shopping centres. Islamabad is situated between the provinces of Khyber Pakhtunkhwa and Punjab but Islamabad is not a part of any province. 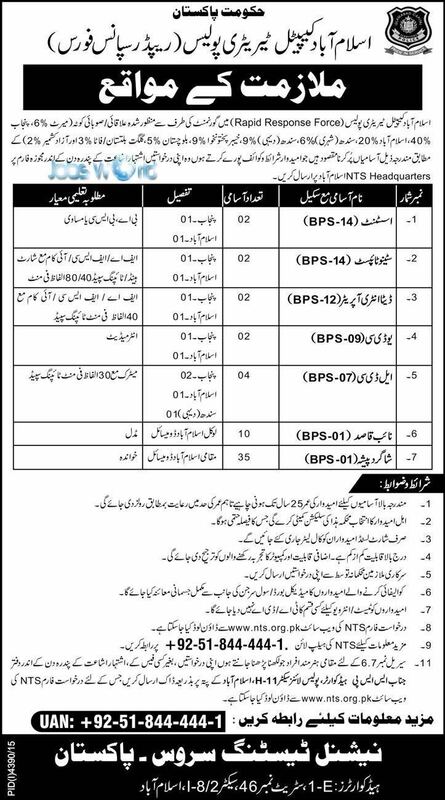 The federal Government of Pakistan controls it and is one of the two federal Territories of Pakistan (the other being FATA) which is directly governed by the Federal Government of Pakistan. Islamabad Capital Territory comprises Islamabad city and surrounding rural areas. The rural area consists of 23 Union Councils, comprising some 133 villages, and city area has 27 Union Councils. The table below lists the 50 Union Councils, each Union Council is named after the main town. The city is divided into eight basic zone types: Administrative zone, Diplomatic Enclave zone, Residential Areas, Educational Sectors, Industrial Sectors, Commercial Areas, Rural Areas, Green Areas. Each sector has its own shopping area, a green belt (which goes across the whole sector in a straight line) and public park. The population of the city is around 1,950,000 of which 66% is urban. It has an area of about 910 square kilometres. The city lies at latitudes 33° 49' north and longitudes 72° 24' east with altitudes ranging from 457 to 610 meters. The main administrative authority of the city is Islamabad Capital Territory (ICT) Administration with some help from Capital Development Authority (CDA), which oversees the planning, development, construction, and administration of the city. 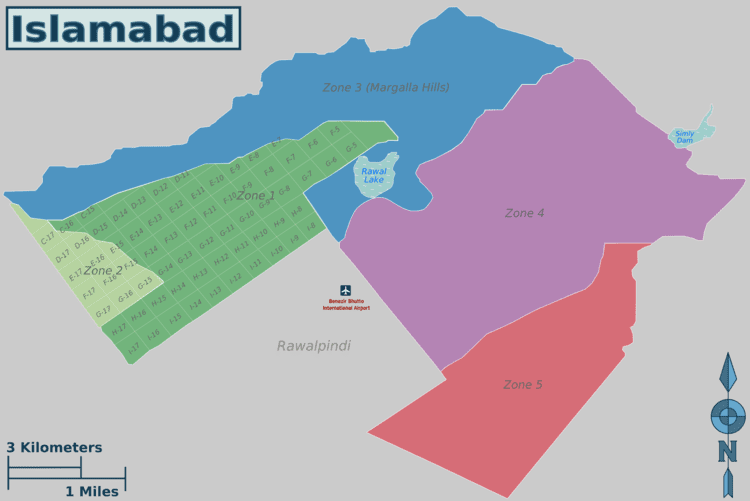 Islamabad Capital Territory is divided into eight zones: Administrative Zone, Commercial District, Educational Sector, Industrial Sector, Diplomatic Enclave, Residential Areas, Rural Areas and Green Area.a.☃☃ Islamabad city is divided into five major zones: Zone I, Zone II, Zone III, Zone IV, and Zone V. Out of these, Zone IV is the largest in area All sectors of ghouri town (1, 2, 3, VIP, 5, 4-A, 4-B, 4-C, 5-A, 5-B and sector 7), located in this zone. Zone I consists mainly of all the developed residential sectors while Zone II consists of the under-developed residential sectors. Each residential sector is identified by a letter of the alphabet and a number, and covers an area of approximately 2 km× 2 km (mi☃☃km (☃☃☃☃mi☃☃× ☃☃☃☃mi). The sectors are lettered from A to I, and each sector is divided into four numbered sub-sectors.